As he nears the end of his presidency, Barack Obama continues to enjoy a broad degree of international popularity. A new Pew Research Center survey conducted in 10 European nations, four major Asia-Pacific countries, Canada and the United States finds that half or more of those polled in 15 of 16 countries express confidence in the American leader. Although he has not been universally praised by global publics throughout his two terms in office, previous Pew Research Center surveys have found higher international ratings for Obama than for his predecessor, George W. Bush. During the Bush era, opposition to U.S. foreign policy and rising anti-Americanism were widespread in many regions of the world, but Obama’s election in November 2008 led to a significant improvement in America’s global image. 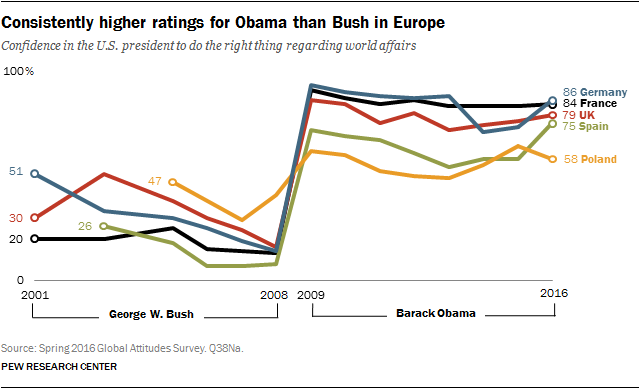 The shift was especially dramatic in Western Europe, where assessments of Bush were grim, but subsequent views of Obama have been remarkably positive. Still, the rebound in America’s reputation did not occur everywhere, especially in a number of strategically vital Middle Eastern nations (see this 2015 report for findings on America’s image in the Middle East and other regions not polled in 2016). And even in nations where ratings for Obama and the U.S. have been strong, there have been some signs of disappointment in the American president. For example, Obama’s use of drone strikes to target extremists in countries such as Pakistan, Yemen and Somalia has been widely unpopular. Obama’s former secretary of state, Hillary Clinton, receives mostly positive marks in this year’s survey. Still, ratings for the presumptive Democratic presidential nominee are consistently lower than Obama’s. Meanwhile, views of Donald Trump, the presumptive Republican nominee, are strongly negative. 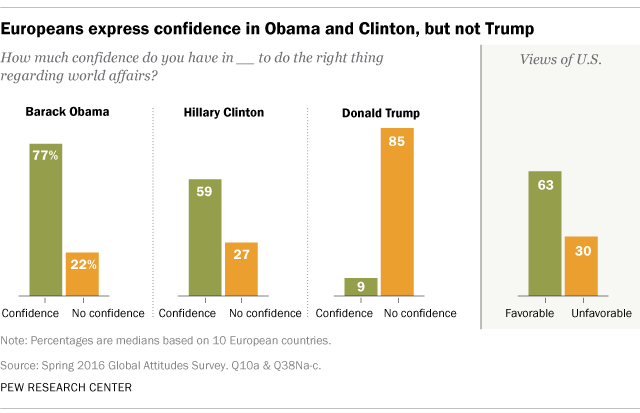 In nearly half the nations polled, the share of the public with confidence in Trump is in single digits. These are among the key findings from a new survey by Pew Research Center, conducted in 16 nations among 20,132 respondents from April 4 to May 29, 2016. The poll also finds that America’s current efforts to fight ISIS in Iraq and Syria elicit very different international reactions than the U.S.-led Iraq War did a decade ago. About half or more in all 15 nations where the question was asked say they support U.S.-led military actions against ISIS in Iraq and Syria. Yet, as the U.S. economy continues to grow slowly but steadily and as China’s once roaring growth rates wane, perceptions of American economic power are on the rise. Today, majorities or pluralities in seven of 16 nations name the U.S. as the leading global economic power; only the Australians say it’s China (in the remaining countries, opinions are more divided). In the European Union, public opinion has moved substantially on this question since it was first asked in 2008. 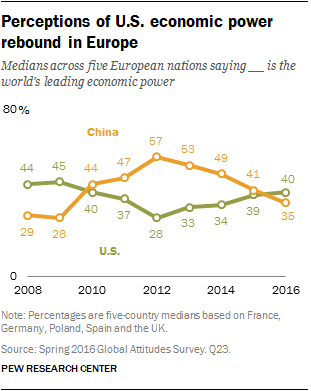 Looking across five EU nations polled each year since 2008 – France, Germany, Poland, Spain and the UK – the median percentage naming the U.S. as the world’s top economic power declined rapidly after 2009, but has rebounded steadily since 2012. American public opinion has also shifted on this question. As recently as 2014, 41% said China was the leading economy, while 40% chose the U.S. Now, just 34% think it’s China, while 54% say the U.S. In the four Asia-Pacific nations surveyed – Australia, China, India and Japan – Obama also receives relatively positive marks. Most Australians and Japanese give Clinton a positive rating and Trump a negative one. The major party nominees are less well-known in China and India. Pew Research Center surveys throughout the Obama era have found largely positive attitudes toward the U.S. around the world, although there are notable exceptions, especially in the Middle East (although Israeli views of the U.S. have been consistently favorable). Among the countries in this year’s poll, ratings for the U.S. are mostly positive. Half or more in every nation have a favorable opinion of the U.S., with the exception of Greece, where only 38% hold this view. Positive marks for the U.S. are especially common in Poland, Italy and Japan, where more than two-thirds express a favorable view. America’s overall image has not changed substantially in the past year in most of the nations surveyed. However, ratings are down significantly in India, Italy and France, down slightly in Spain, and up slightly in Germany and China. Chinese public opinion has shifted from leaning slightly negative in 2015 (44% favorable, 49% unfavorable) to leaning slightly positive this year (50% favorable, 44% unfavorable). Perceptions of China are, on balance, negative in most of the nations surveyed. Ratings for China have slipped in France, Spain, India, Italy, the UK and Germany. Just 37% of Americans express a favorable opinion of China, essentially unchanged from last year’s 38%. Only 11% of Japanese see China positively, little changed from the 9% registered in 2015. America’s reputation for upholding individual liberty has often been a strong component of the country’s soft power, and it remains so today in many nations. Majorities in 10 of 16 countries say the U.S. government respects the personal freedoms of its people. Looking at the five EU nations we have surveyed consistently since 2008, the share of the public saying that Washington respects personal freedoms rose between 2008 and 2013, but has fallen in the years since. In France and Germany, for example, the share of the public that says the U.S. respects personal rights is lower today than it was during the final year of the Bush presidency. The survey also finds that international publics see a mix of both good and bad characteristics in the American people. Survey respondents were read a list of six traits, and for each one, were asked whether this is something they associate with Americans. On the positive side, half or more in 15 of 16 nations say Americans are optimistic, and majorities in 14 countries think Americans are hardworking (although relatively few in China or Japan say this). Americans overwhelmingly think of themselves as optimistic and hardworking. Nearly two-thirds in the U.S. (65%) also say Americans are tolerant, but international publics are less convinced. While half or more hold this view in Poland, Japan, Germany and Italy, most in China, Sweden, Australia, the UK, France and Canada believe Americans are not tolerant. Moreover, many around the world also associate negative characteristics with the American people. Half or more in 10 countries think Americans are arrogant and many say they are greedy. Interestingly, most in the U.S. say Americans are arrogant (55%) and greedy (57%). Fewer describe Americans as violent, although half or more express this opinion in Australia (68%), Greece (63%), the UK (57%), Spain (55%), Canada (53%) and China (52%). A sizable share in the U.S. – 42% – also says Americans are violent. Public opinion in the U.S. divides sharply along partisan lines: 50% of Democrats and 44% of independents characterize Americans as violent, compared with just 29% of Republicans.